The future of running back Maurice Jones-Drew is one of the key issues the Jaguars will have to address in the offseason. 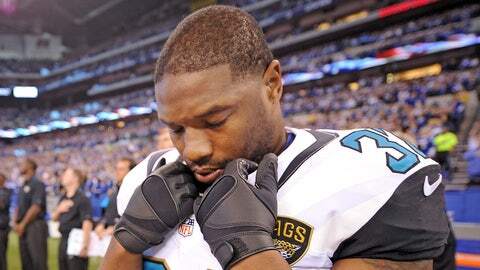 Maurice Jones-Drew was talking about his upcoming contract situation as he enters free agency. But the Jacksonville Jaguars running back could have just as easily been referring to the just-completed season of the team with which he has spent his entire NFL career. "I think (owner) Shad Khan said it best: Hope for the best, plan for the worst," Jones-Drew said Monday, the day after the Jaguars finished Gus Bradley’s first season as head coach with their third loss in a row and 12th of the year. An optimist would say the Jaguars doubled their win total from 2012 by going 4-12. A realist would say they ended up ranked even lower in total offense and rushing offense than the year before while surrendering the same number of sacks (50) and making largely miniscule improvements on defense. Bradley’s hopeful demeanor was severely tested during the first two months of the regular season. While things improved over the next five weeks, take a look at what happened to the coaches of the teams that lost to the Jaguars: Houston fired Gary Kubiak after the Texans fell to them twice in less than three weeks, Cleveland fired Rob Chudzinski on Monday, and Mike Munchak remains on shaky ground in Tennessee. 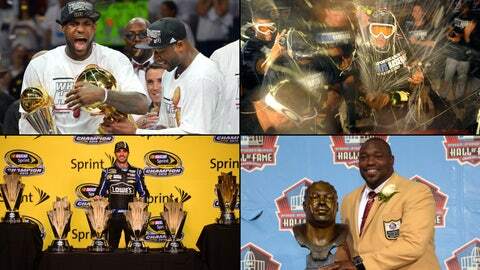 Take a look at the top sports stories that shaped Florida in the past year. The Jaguars were not the worst team in their own division, much less the entire league. But the best anyone can expect in 2014 is another season of gradual growth and a different look at the quarterback position. Except for giving Peyton Manning and the Denver Broncos all they could handle for three quarters, the first eight weeks of the season were Murphy’s Law in action. Just look at what happened to their three most recent first-round draft picks. Blaine Gabbert, entering what was universally regarded as a make-or-break season for him, got injured twice in the first five games and never took another snap from center after that. Wide receiver Justin Blackmon returned from a league-imposed four-game suspension only to run afoul of the substance abuse policy heading into the bye week. And tackle Luke Joeckel suffered a season-ending fracture to his right ankle. The Jaguars were beaten by at least 10 points in every game during their 0-8 start and managed a total of three field goals and a safety in their first three home games. The lowest point was a 37-3 drubbing at the hands of the Indianapolis Colts in which Gabbert threw three interceptions, one of which was returned for a touchdown, and Jones-Drew was held to 23 yards on 13 carries. It’s easy to blame the offense, but the defense wasn’t without its problems early on. The Jaguars gave up more than 100 yards on the ground in every game during that losing streak, capped by a 221-yard gashing courtesy of the San Francisco 49ers in London. The inexperience in the secondary was reflected in this statistic: The Jaguars had a total of only three interceptions in the first half of the season. During the final eight weeks, wide receivers Michael Floyd of Arizona and Josh Gordon of Cleveland had long plays and huge days at the defensive backfield’s expense. After all of the ballyhoo to make fifth-round draft pick Denard Robinson someone who defied a position label — remember the "offensive weapon" tag? — the Jaguars never used the former Michigan quarterback a whole lot. He never threw or caught a pass, returned only four kickoffs, and fumbled the ball a team-high three times (losing two) on 20 carries. The Dolphins, Steelers and Giants are among those who'll visit the Jaguars in 2014. Despite being outgained 362 yards to 214, a 29-27 victory at Tennessee lifted the cloud of the not-unrealistic prospect of a winless season. Chad Henne didn’t put up dazzling numbers in place of Gabbert, but he was efficient during a three-game winning streak, throwing just one interception and leading the Jaguars on a touchdown drive in the closing minutes against the Browns to pull out a victory. Jones-Drew ran for 803 yards and missed only one game a year after his future was in doubt when he injured his left foot. Wide receiver Cecil Shorts III followed up his breakout season in 2012 by increasing his reception total from 55 to 66, and rookie Ace Sanders had moments of brilliance as a receiver and punt returner. Led by defensive ends Justin Babin and Andre Branch, the Jaguars finished with 31 sacks, 11 more than they had the year before. Tackle Sen’Derrick Marks was so valuable of a free-agent signee that the Jaguars rewarded him last week with a four-year contract worth $23.5 million. They also got bargain-basement steals in running back Jordan Todman, tackle Austin Pasztor and defensive end Ryan Davis. From an emotional standpoint, the inclination would be to bestow this honor on center Brad Meester. Not only did he and guard Uche Nwaneri hold together a line that went through plenty of upheaval with the injury to Joeckel and the trading of Eugene Monroe, but the 14-year veteran got quite a sendoff in his final home game. Although the Jaguars lost 20-16 to the Titans, one of their touchdowns was set up by a screen pass in which Meester lined up as an eligible receiver and picked up 9 yards. But that would be shortchanging the steady play of middle linebacker Paul Posluszny. In addition to leading the Jaguars in tackles for the third year in a row — rookie strong safety Johnathan Cyprien was the only other player with more than 100 — he returned a Manning pass 59 yards for the first touchdown of his career. That was one of two defensive scores by the Jaguars. Cornerback Will Blackmon, who was signed toward the end of preseason, had the other with a fumble return that sealed their win over the Titans. Jones-Drew, who made $4.95 million in the final season of his five-year contract, and Henne are clearly the two biggest names going on the market. Jones-Drew will turn 29 in March, and running backs tend to be far less productive by that age. Henne will also be 29 by the start of training camp, with his future in Jacksonville to be determined in large part by whether the team is leaning toward using the third overall draft pick on a quarterback. Pasztor and Cameron Bradfield, who served as bookends to the offensive line with Joeckel and Monroe no longer in uniform, could figure in their plans. The same goes for wide receiver Mike Brown and fullback Will Ta’ufo’ou. 1. Who is the Jaguars’ quarterback of the future? If it isn’t Gabbert — and all signs point to that being the case — where does he end up? 2. Is Justin Blackmon worth the continued aggravation? 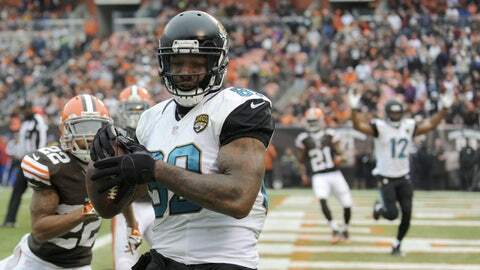 If not, how do the Jaguars go about finding a big-play receiver who can complement Shorts? 3. The Jaguars were next-to-last in the NFL in rushing with Jones-Drew. How much better or worse off would they be without him?